"The polls last week ago showed that around 24% of people didn't want to vote, and the week before it was 30%. "So people have decided to vote at the last minute, young people and low-paid workers who are angry about unemployment and wanted to vote against the incumbent. Traditionally the older people and middle class vote anyway." Question: Why don't poor people vote in the United States? They are several reasons at play as to why poor people don't vote. The Government Accountability Office found in this report, that in most state it costs between $5 - $60 to obtain a vote ID, alternate ID like a passport or driving license also cost money to obtain, and people who don't travel or don't drive may not have needed either before. This may not seem like a huge amount of money but when you're on the breadline every dollar counts. Also another factor is that poorer people are more likely to move home than wealthier people, and that moving home can jeopardize voter eligibility as you have another layer of red tape and paperwork before you can get to the polling station, an MIT study estimated that 1.2 million votes were lost in 2012 due to registration problems alone. A lot of poor people are paid by the hour, and if the election is being held on a working day (like in America) you simply can't afford to take the day off. In the 2014 US mid-term elections, a report commissioned by the Pew Research Centre found that 35% of people who didn't vote did so because of scheduling conflicts with work/school. Countries where voting is held on a week-end or public holiday like Australia, Brazil, France, Germany, and Italy typically have higher voter turnouts. A sub-category of this is long lines: in 2016, people sometimes had to wait for hours to cast their ballot. For someone who is losing money for every minute they spend in a line to cast their ballot, having to spend several hours is unappealing at best. Poor people don't have the time to read thousands of pages of news/policies and they don't spend their luncheon reading the Economist. As your article says, policies tend to be tailored towards wealthier constituents, so poorer voters may have difficulty understanding some of the more complex or technical terms used in the political discourse. Another article which claims this is here; poor people don't feel represented so they don't vote. A very blatant example of this was the 2016 Presidential Election where both the major candidates of political parties (Hillary Clinton and Donald Trump) were multi-millionaires/billionaires who had extremely good educations (Yale/Wharton School of Business); these education institutions are often inaccessible to the poor. In fact, almost every single president of the US has at least been some form of millionaire. tl;dr- People who made less than $15,000/yr were 30% less likely to vote because a significant portion of that segment of the population was disaffected. Disaffected people tend to lack an interest in both finance and politics, as shown by Pew Research studies cited below. Update: Added a significant part to the start of this answer to clarify the question. 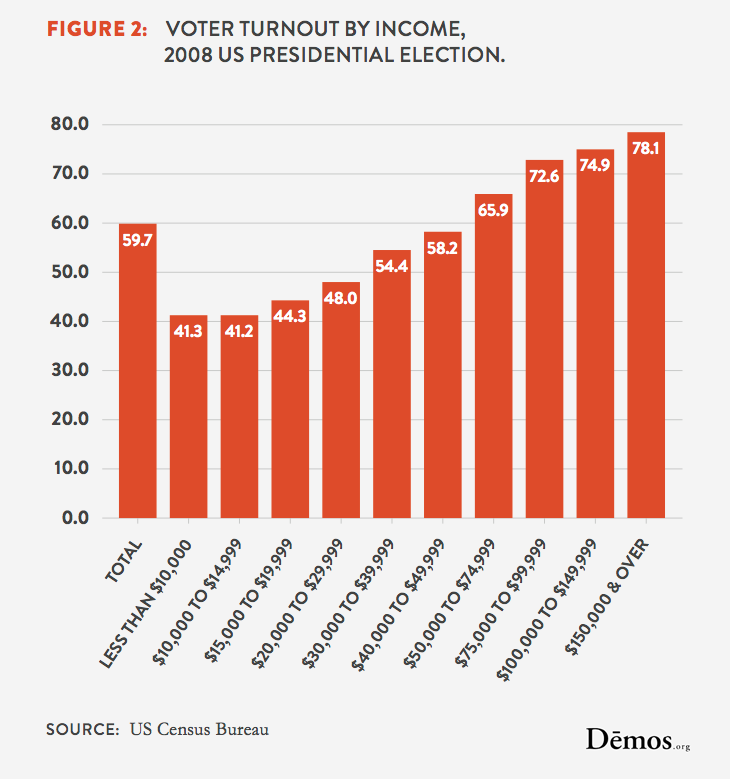 The big point here is that less than 1-in-5 low-income Americans didn't vote compared to the average American. This answer explains that disaffect is the primary cause for these less-than-1-in-5 (~18.5%). 41.3% of Americans who made less than $10,000/yr voted. 41.2% of Americans who made $10,000/yr-to-$15,000/yr voted. This means Americans who earned no/little money were about 30% less likely to vote than the average American (41.25%/59.7%=~69.1%). If low-income Americans voted as much as the average American, then only about 59.7% of them would've voted, compared to the 41.25% that did. So, whatever's causing their reduced voting rates, it's impacting only about 18.5% of low-income earners (59.7%-41.25%=~18.45%). Low-income Americans include pretty much everyone who's unemployed or works very few hours. However, it can also include college students, entrepreneurs working on a startup, and people in prison (I'd assume - haven't checked the data collection methodology). So, we're talking about low-income earners rather than people who're necessarily "poor". Studies have shown that significant portions of the population are disaffected. They don't tend to make much money, and they're generally not too interested in politics. The central point of this answer is that they're a large enough group to explain much of the small disparity in voting rates between low-income earners and the average American. Back in 2005, Pew Research published "Beyond Red vs. Blue", in which they attempted to use data mining techniques to group Americans into more robust subsets than conservatives (Red) vs. liberals (Blue). This study found two relevant groups: "Bystanders" and "Disaffecteds". The study's since been repeated, most recently in 2014. The groups are recalculated each time; this time, the relevant groups are called "Bystanders" and "Hard-Pressed Skeptics". You can check out their characteristics under "Learn About Types" here. As can be seen under "Demographics", Bystanders have the least income across all groups. They're pretty much defined by the fact that none of them (0%, according to Pew Research) are even sure that they're registered to vote. They just don't care about politics. Hard-Pressed Skeptics are similar, though not as extreme. They make the second lowest income across all groups (after Bystanders) and have the second lowest voting turnout (again, after Bystanders). As the group's name suggests, they lead hard lives and have skeptical (cynical) outlooks. Bystanders are on the sidelines of the political process, either by choice or because they are ineligible to vote. None are currently registered to vote. Most follow government and public affairs only now and then (32%) or hardly at all (32%). Bystanders express relatively low interest in business and finance and, not surprisingly, government and politics. Referring to the above graph that the numbers in the question come from, people who made less than $10,000/yr had the same voting rate as people who made $10,000-$15,000/yr. Minimum wage laws mean that no one regularly working full-time or near-full-time can fall into this category. So while it's true that work schedules can dissuade people from voting, that doesn't help answer this question since people who are unemployed and working very part-time vote the least. Further, this report (2015) shows that people who make more money work more on average. Taken together, this means that there's a positive correlation between hours worked and tenancy to vote. In short, work schedules aren't why people in this income bracket vote less than others. In reality, it's likely that this demographic's reduced work load offsets their other reasons for not going to the polls. This issue's fairly sad because it largely observes that a significant portion of the population's given up. This is a harder issue to fix than other proposals like limited access to the polls or work conflicts. This answer focuses on disaffect as that seems to be the primary factor that explains most of the disparity in voting rates. However, there are other factors that contribute. For example, sampablokuper's answer correctly points out that voter suppression happens. While I'd argue that it's a minor effect, it's still part of the overall picture. Another factor might be access to personal transportation. One factor among many is voter suppression: the adoption of policies designed to inhibit the exercise of the franchise among likely political opponents, such as the poor. Selma (film): dramatisation of historic struggle against voter suppression in Alabama. The great British Brexit robbery: how our democracy was hijacked. After years of preclearance and expansion of voting access, by 2013 African American registration and turnout rates had finally reached near-parity with white registration and turnout rates. African Americans were poised to act as a major electoral force. But [in 2013, the Supreme Court] issued Shelby County v. Holder, 133 S. Ct. 2612 (2013), eliminating preclearance obligations... [Republican Party politicians, who had recently re-taken control of the North Carolina General Assembly, then] requested data on the use, by race, of a number of voting practices. Upon receipt of the race data, the General Assembly enacted legislation that restricted voting and registration in five different ways, all of which disproportionately affected African Americans. Faced with this record, we can only conclude that the North Carolina General Assembly enacted the [legislation] with discriminatory intent. Given that poor people lean strongly Democratic (How Do the 47% Vote? ), and the mood in the Republican party that "politics is war" (Robert Mercer: the big data billionaire waging war on mainstream media), it is easy to see why some Republican party politicians stoop to voter suppression. psychologically repulsive to the target demographic. My direct answer is: I don't know. I'm not poor. Holder said back in 2012, that 25% of blacks don't have a driver's license. Another study indicated that 10% of eligible voters didn't have a driver's license or other form of ID. No differentiation between poor and rich, but one can assume that poor people made up a much higher percentage than even average income people, almost all of whom have driver's licenses. Still, it's hard to say that 60% of poor people don't vote because they don't have an ID - you must have some form of ID to get government assistance. What surprised me is how a casual search for 'poor people ID percentage' turned up no actual studies to quantify how many poor people can't identify themselves at the voting booth, so I have to wonder what the argument that voter ID is responsible for low poor people voting is based on. If any such studies have actually been carried out, they should leap to the top on a google search. In an anecdotal reference, the township of Ferguson, that spawned the 'unarmed black man shot by police' meme, was 60% black, yet at the time of that incident, the city council was all white. Since then, the residents of Ferguson took an interest in their city council elections, and started electing black people. From that, it appears that the residents of Ferguson, a somewhat poor community, could vote, they just didn't vote... until they got a wake up call. Not the answer you're looking for? Browse other questions tagged united-states voter-turnout or ask your own question.